I must confess, The Goddess has never met an eggplant she hasn’t loved. I’m afraid it’s true. And The Latin Lover is okay with it, so don’t worry. He knows all about it. This original recipe came from Epicurious and of course, The Goddess made a few little changes. I was having dinner with The Flying Librarian and she served this as part of an antipasto. Now, she’s a great cook, so The Goddess paid attention; she was right. This is a great little thing to have tucked in the fridge. And,it will keep in the fridge for at least 2 weeks. I just made a grilled wrap with a couple of roasted peppers, some thinly sliced red onion, a little shredded cheese and the very last little bit of salsa tartufata…which is now gone…boohoo! It’s terrific as is, as a “salad”, placed on burgers and in sandwiches (and tortilla’s, it turns out) and is a great antipasto with some good bread. It’s just so good to know that you have this flavor-packed goodness sitting there, in the fridge, just waiting to be savored. I’ve suggested this is of medium difficulty, which is really more related to time than actual difficulty. The bonus, of course, is that it keeps so well, so you get real benefit for your time. And then there’s the flavor….mmmmm! 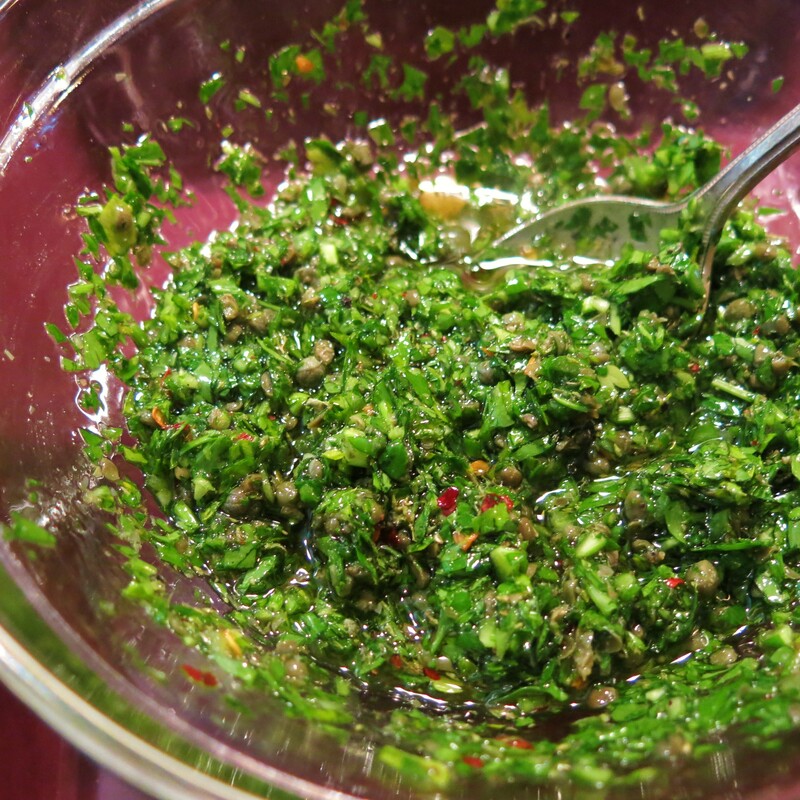 Finely chop the parsley and mint; chop the capers and garlic. 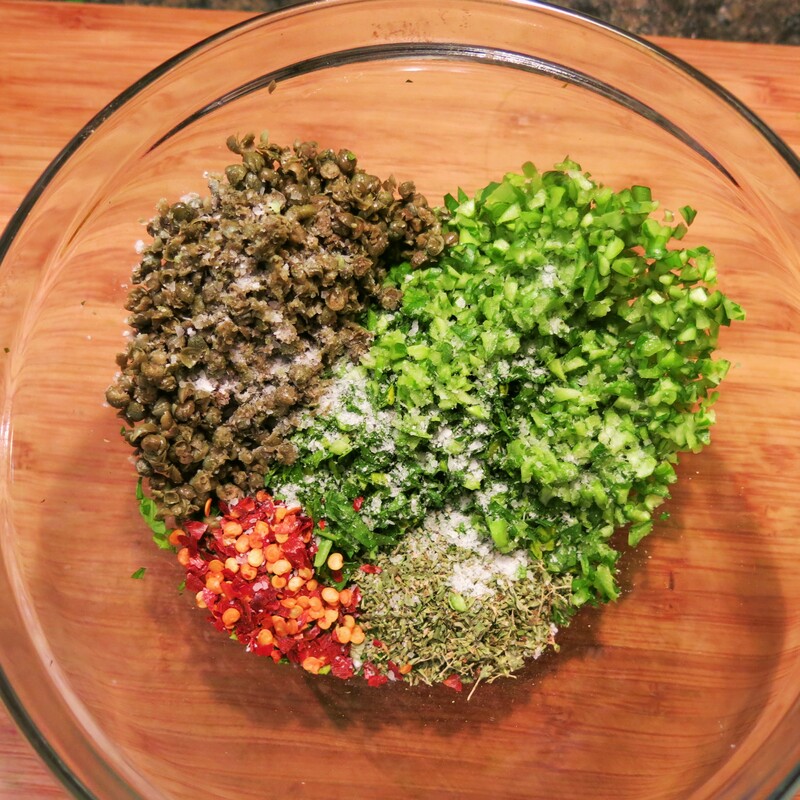 Place in a bowl; add the oregano and pepper flakes and stir everything together. Stir in the oil, season with salt and pepper, and set aside. Put enough eggplant slices on the grill to cover it without crowding. Cook the eggplant until well-marked, 3 to 6 minutes, then turn the slices over. Cook until tender, about 3 minutes more. 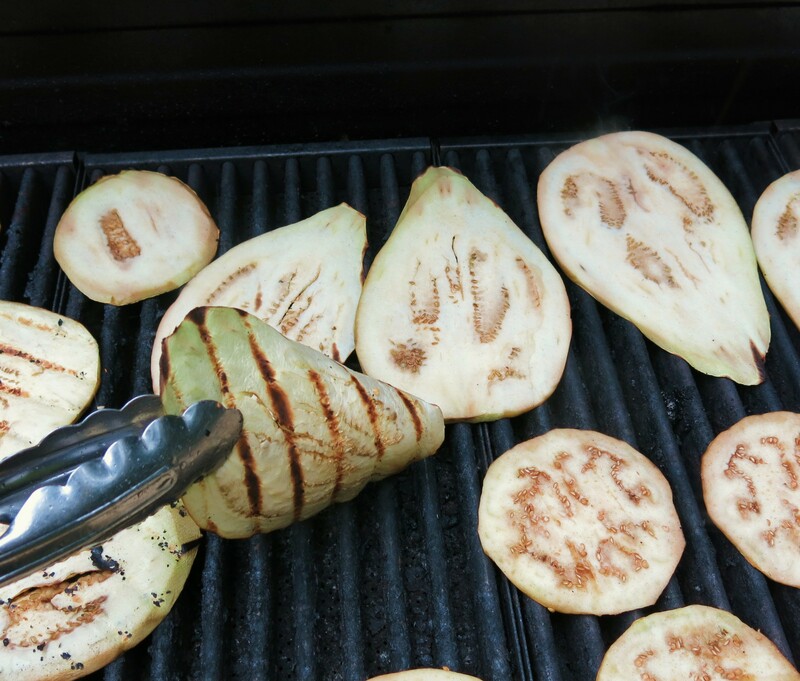 Remove the eggplant from the grill. 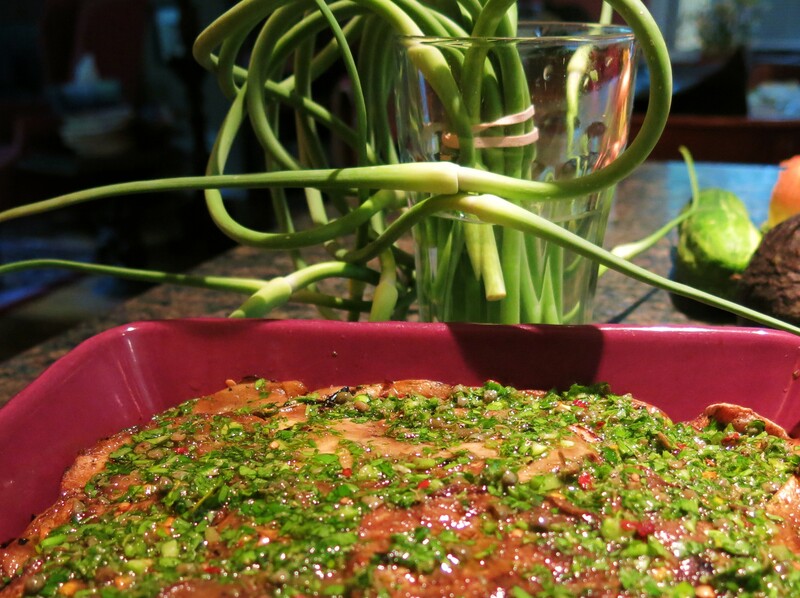 Spoon 2 tablespoons of the parsley mixture onto a platter and spread it evenly with the back of a spoon. 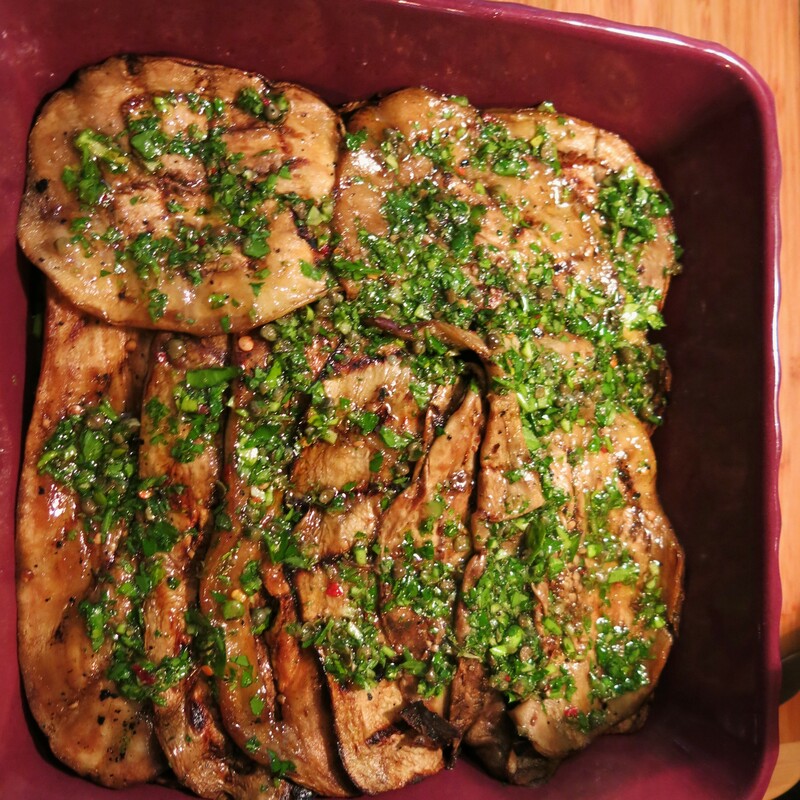 Arrange half of the grilled eggplant on the parsley in a single layer. Smear with more of the parsley mixture. 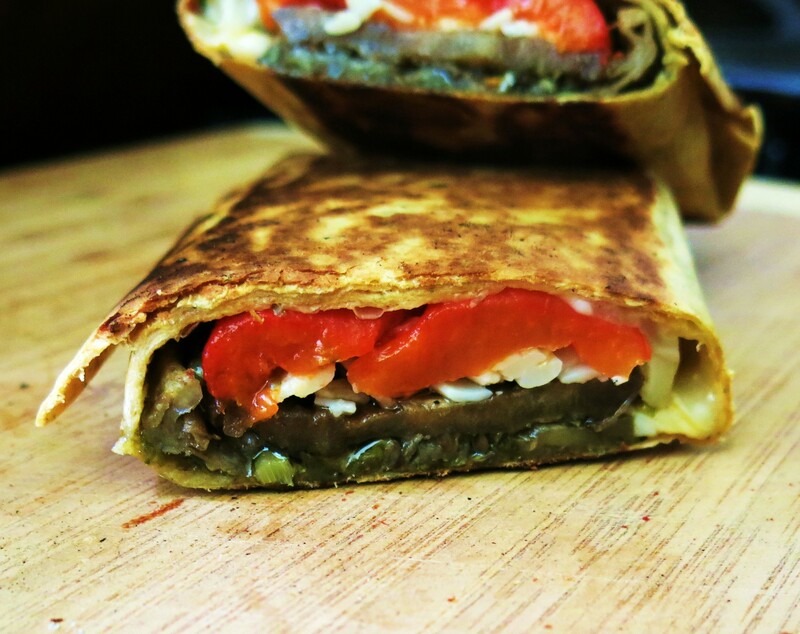 Continue layering eggplant and spreading each layer with 2-3 tablespoons of the remaining parsley mixture. Cover the dish with plastic wrap and set aside to marinate at room temperature for about 2 hours (or refrigerate for longer). Serve at room temperature. Keeps well, refrigerated, for 2-3 weeks. NOTE: Instead of dipping the slices in the balsamic, I used a spritzer bottle of balsamic that worked great. I spritzed both sides of each piece of eggplant as they came off the grill. Then I put the slices in a large container and spritzed a bit more over and a good sprinkle of salt, too. Then I continued with the recipe as written. You could make the parsley mixture in a food processor, but I don’t. I find hand-chopping gives me the somewhat drier and coarser texture, which I prefer. I drizzle extra oil and a little extra balsamic over the top layer. In this case, peel the eggplant and slice it thinner rather than thicker, a bit less than 1/4-inch. 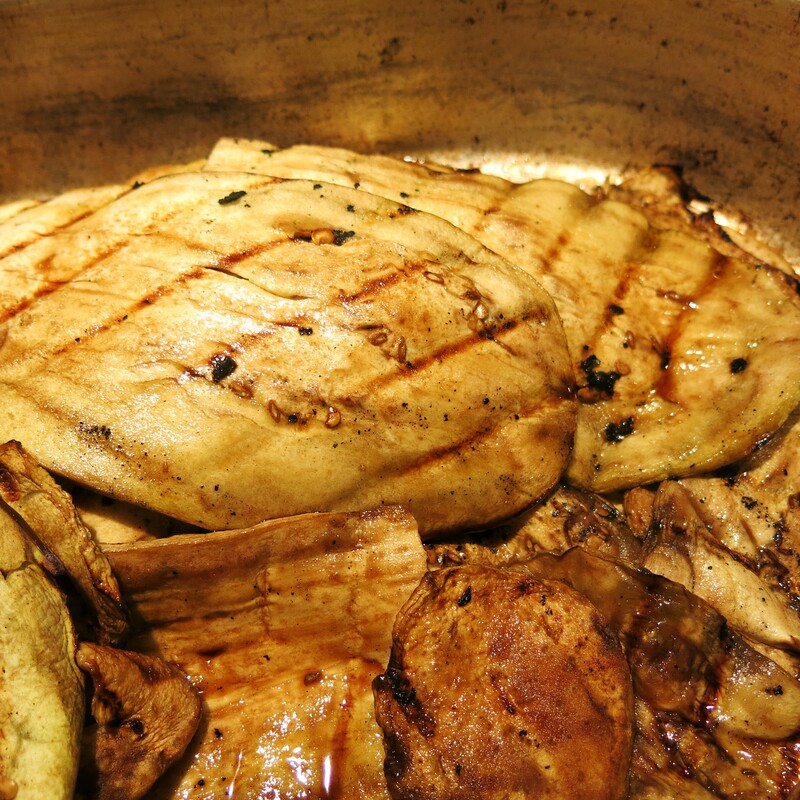 I don’t salt or oil the eggplant; I grill it dry, just until you get good grill marks, but it still has texture. 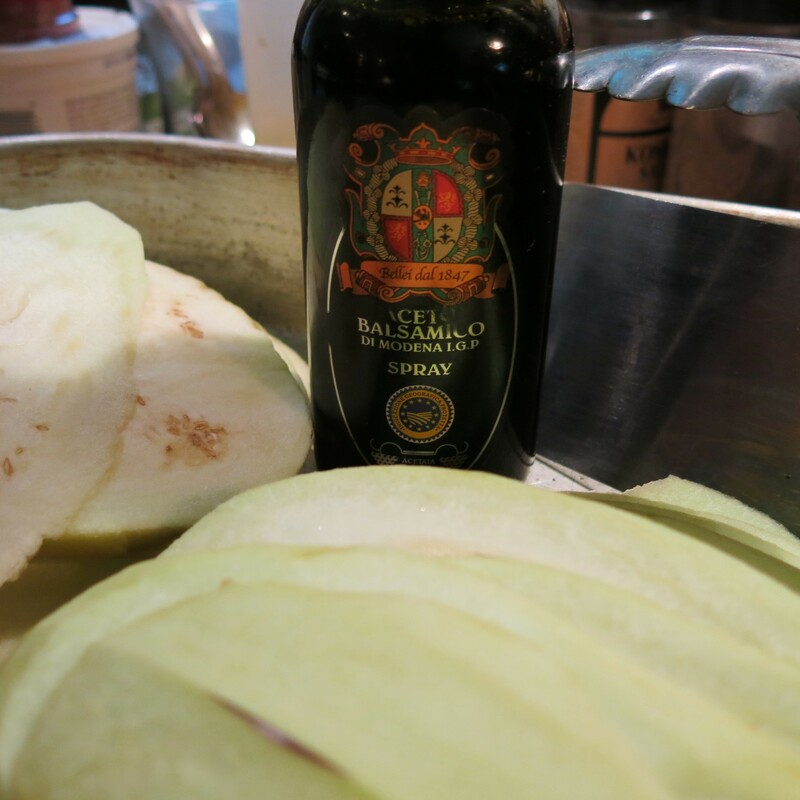 When The Lover and I were in Italy I discovered balsamic in a spritzer bottle. Isn’t that about the best little invention you’ve ever heard of? I absolutely love it. You can purchase these bottles of lusciousness in various places here in the US, but The Spice Mill has them. As soon as I pull a slice of eggplant off the grill, I spritz both sides, lay them in a dish and re-spritz, just in case I missed a spot! I chop the parsley and mint by hand, but use the food processor, if you wish. I wanted the coarser, drier texture. Also, I still had some garlic scapes, and I used those instead of the garlic. Why not; they are so fleeting and delicious? Then I combine it all in a bowl. I stir in the oil until it’s almost a moist, thick paste. 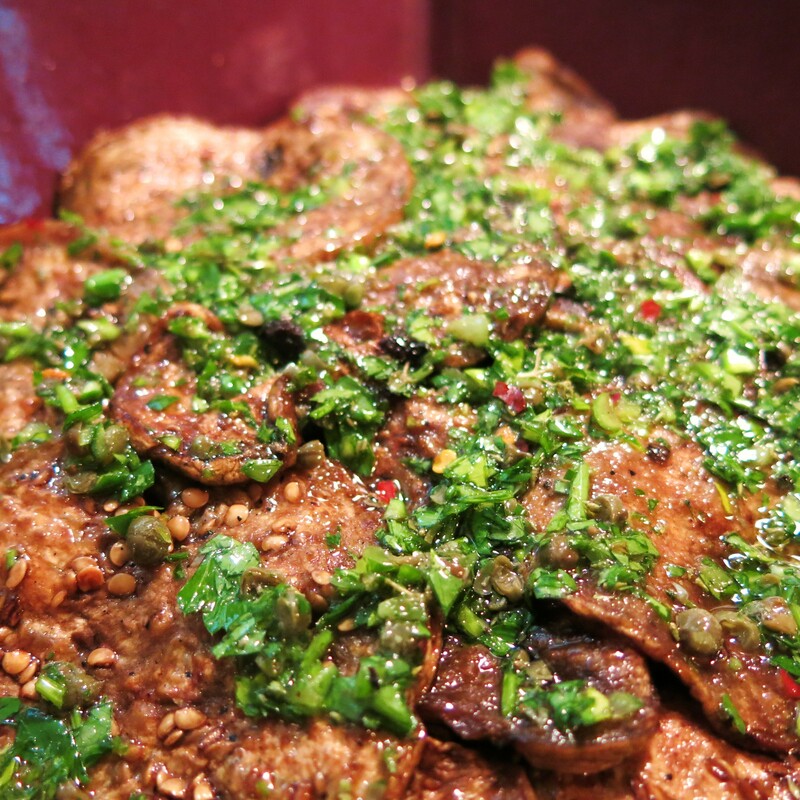 Now, you just start layering the herb paste and eggplant slices into a dish, beginning with a couple of tablespoons of the herb paste in the bottom of the dish, then eggplant, then herb paste, eggplant, etc. I use the back of the spoon to sort of “pack” the eggplant into the dish. And that’s really all there is to it. 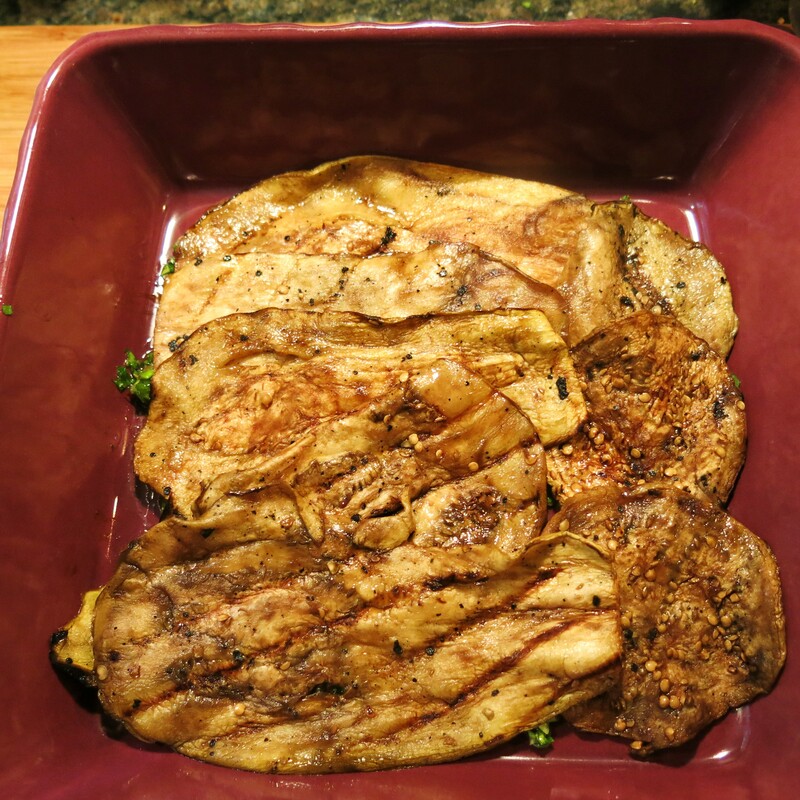 I marinate the eggplant as soon as it comes off the grill, so the flavor of the marinade penetrates the eggplant completely. Then, I cover it and let it stand, at room temperature, for a couple of hours. You can do this several days ahead (refrigerate it, please) and it just gets better each day. It is excellent as part of an antipasto plate with some creamy, fresh mozzarella and good olives. Try it…’tis the time of year.